Shion 3.0β4 is now available. 3.EZServe network controller support is not present in this release. This update adds a new “Favorites” option that allows you to designate favorite devices, snapshots, and triggers. The selected items appear in a new “Favorites” section in the topmost item browser. 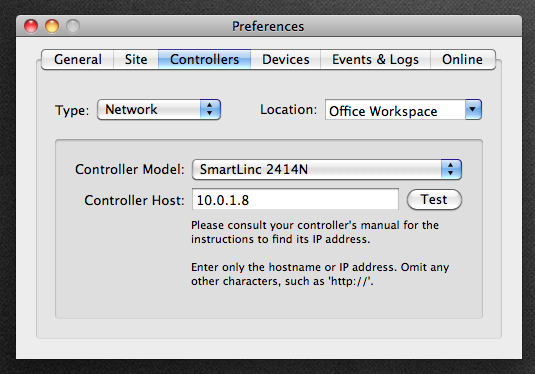 This release also adds initial support for the SmartLinc 2414N networked INSTEON controller. While it may be used to send commands to X10 and INSTEON devices, it can only receive status updates from INSTEON lamp and appliance modules. The thermostat and any sensor devices are unsupported, and will likely remain so given the fundamental limitations of an HTTP-based controller. While it should be able to receive status updates for X10 appliance modules, I had no success achieving this. Consequently, it will only send commands to X10 devices. Status updating is much slower. Changes in a device may not be picked up for several minutes. For users with the SmartLinc controller, I encourage you to give this release a try and send me your feedback. This is not a controller that I use regularly, so I need more help from the community verifying that its driver code is solid. If you’re using this controller and have some additional feature requests, please let me know. While the controller does not support monitoring thermostat and sensor devices at the moment, there may be a way to get some very basic support if there’s user interest. Also, special credit goes to Scott Newman, who was instrumental in helping me achieve what limited status updates we have. Prior to his encouragement, I didn’t think that any status updates would be possible.